Gazprom, Russia’s largest gas company plans to expand the program of import substitution by no longer buying metal and engineering products from more than 400 foreign firms, which could mean $2.5 billion in lost orders from Russia. From now on metal products and machinery items, including agricultural and road construction equipment will be purchased mainly from Russian producers, “except in case the goods are not produced, or there is no counterpart, in Russia,” Vedomosti reports Tuesday referring to a Gazprom document. The companies on Gazprom’s ‘blacklist’ include suppliers from about 20 countries. Firms from the US (Caterpillar, Motorola), Germany (Siemens, MAN Turbo), France (Schlumberger, Schneider Electric), the UK and Japan (Sumitomo, Kenwood, Kawasaki) make up more than a quarter of the companies affected, according to the document obtained by Vedomosti. Besides the products from Western countries supporting the anti-Russian sanctions, Gazprom is considering replacing supplies from number of companies in Belarus, Ukraine, Israel, India and Argentina. Gazprom officials have said they were thinking of looking at alternative suppliers from China or Korea that aren’t already on Gazprom’s list of foreign suppliers. Gazprom’s purchases in foreign currency account for about 21 percent of its capital costs, according to Deputy Chairman Andrey Kruglov. 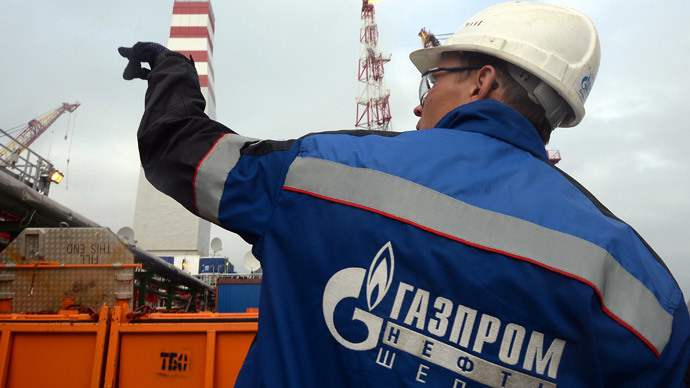 Capital costs of Gazprom for 2015 will be $11.6 billion (733 billion rubles). That means almost $ 2.5 billion (or 154 billion rubles) were allocated to foreign purchases. In early February, Gazprom created a special department for import substitution with a mission to ensure the company’s technological independence. A similar department was established by its oil subsidiary Gazprom Neft. The company says its new policy will see as much equipment as possible produced in Russia. Experts suggest Gazprom could find it difficult, and it could cause problems with such projects as Baltic LNG, the Power of Siberia and the Turkish Stream pipelines, as there is a lack of Russian hi-tech producers. In February Russian Prime Minister Dmitry Medvedev claimed that most machinery could be replaced with “Russian-made” equipment. At the time he signed abillbanning the ordering of new imported foreign machinery for state-run organizations. It’s part of Russia’s anti-crisis plan that has import substitution as one of the main tools in stabilizing the economy.